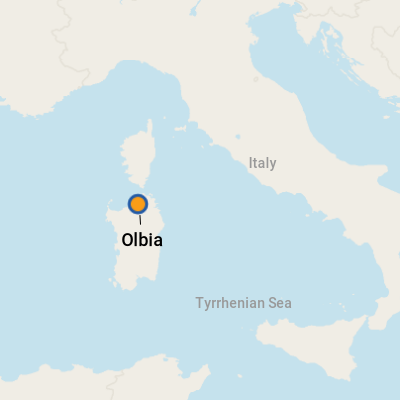 The city of Olbia is the gateway to Costa Smeralda -- the Emerald Coast -- of Sardinia, the second-largest island in the Mediterranean Sea. (Only Sicily is larger.) Located about 150 miles southwest of Italy's mainland harbor town of Civitavecchia, this port town has two distinct faces. It's a quaint and easy-to-navigate town with museums, historical churches dating from the 11th century and the lovely Corso Umberto thoroughfare that's lined with boutiques, gelato shops, restaurants and cafes. But in the summer months, Olbia is also a quintessential beach town with beautiful stretches of white sand that are ideal for lounging. Watersports are popular here, too, and rentals -- boats, sea kayaks, windsurfers -- are available for those that prefer a more active day in Sardinia. Because the port is a busy one -- complete with ferry service -- it does not allow cruise passengers to walk through the active dock area. Instead, you'll hop on a complimentary shuttle bus that takes you a mile or so down the road to Piazzale Benedetto Brin. Here, you can easily walk to visit the Museo Archeologico di Olbia (which outlines the history of the historic old town) and Museo del Mare (a maritime museum) -- both are right next to the bus drop-off. You can stroll Corso Umberto to enjoy a cappuccino at an outdoor cafe or visit some of the historic churches in town, including San Simplicio and San Paolo. The official currency is the euro. You can find banks and ATMs on Corso Umberto. For up-to-date currency exchange rates, visit www.xe.com. Italian is the official language but many locals -- especially those working in the shops and restaurants that line Corso Umberto -- understand English.